ActiveChat is the new kid on the block. 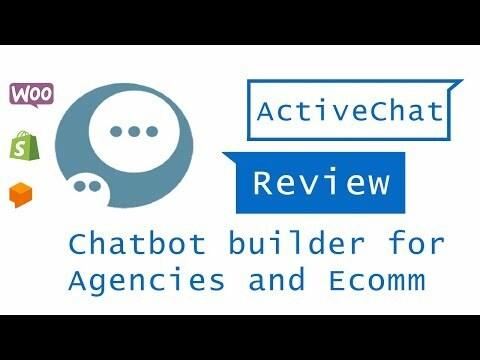 My first contact with the ActiveChat team was about a year ago, when I was searching for a solution to create a cart abandonment system for one of my clients. Andrew (Andrii) the CEO had already solutions to connect existing platforms to WooCommerce, and had Shopify and 3dcart in the making. He and the team is very knowledgeable and have been building bots for quite a while. They’ve seen all the positives and negatives of other bot builders and instead of complimenting them with certain functions that they are not capable of they’ve decided to create their own system where all those advanced functionalities are available. I was fortunate to see the progress and different stages of the software, providing feedback several cases. It wasn’t until 2019 that I’ve realized after talking to Andrew again. The product is ready for the market. I’ve been testing it pretty much every day since and start to like it more and more. It’s main strengths are currently its deep integrations with Google’s Natural Language Processor, Dialogflow and shop engines such as Shopify and WooCommerce. Now the platform just opened up more and is in the phase that it still needs to improve a lot . Having said that, all of the reviews it has already gained are rather positive. That is also a great opportunity for the users to actually take part in the brainstorm and make a positive impact on the tool the team seems to be open-minded and takes into account what we have to say. In the comments, there are already a lot of suggestions about the possible changes. Also the staff in some cases assured the users they are already working on some of the reported inconveniences. Connection to CRM, auto-responder or human takeover just to mention a few. As I’m a fairly new user and didn’t find a hack for everything that’s not native (Andrew usually shows me those). Regardless, I’ll do my best to give the most objective review of this software in terms of where it is today. The sign up process was fairly straightforward, I like the fact that we are able to sign up via email and not just Facebook like other competitors. As the platform offer more than just Messenger, a Facebook connection is not even needed if you want to stay with Telegram or Twilio. Little bubbles help the onboarding process, which even as a seasoned bot maker I found to be rather useful. Also, the user is literally a click away from accessing the resources from other builders. When it comes to getting your head around the builder, the opinion varies. Most users claim that it is an easy tool and having read the manual everything seems clear. Some disagree, pointing out the steep learning path in AC. To me it was pretty intuitive to work with but the staff providing contact and being over 2 years into bot building is also a big plus. The visual builder itself is also a big step forward; not only does it have a neat cover but it also provides a simple way to organize your bot exactly the way you want it. The biggest units are the skills that you can see on the screen and switch on the top bar. Here you can create your ‘flow’ connecting different blocks with each other from the left side. You can easily drag and drop different blocks to the skills. What I personally found a little bothering is the issue of the connection lines between blocks. Deleting and creating these lines is rather natural but choosing them with your mouse pointer (to do the described things) is quite a challenge. They also are not included within the ‘copy’ function. It offers the most used conversational elements such as galleries, quick replies and user input (it’s called listen and took me time to find…). Still a few conversational design elements are lacking, I’ve noticed list (which I barely ever use), native video and voice support Not entirely sure if I can add a file like pdf either. Another positive thing – it saves automatically so you do not have to be worried about losing progress. Another nice thing is that it does not go ‘live’ just by changing some texts immediately, for that there is a run button on the top right corner. To be honest, I’m not sure if they handle simple keywords by themselves as they offer a very easy way to utilize Google’s Dialogflow that can make the chatbot so much smarter. That was naturally appealing to me as on other platforms such as ManyChat or Chatfuel, I needed to use Janis or other solutions to connect with an NLP tool. That way it’s not just a simple question a user asks, but we can give the conversation a context, save user input easily and add many different questions effectively and smarter. (using entities). entities are automatically saved and forwarded to Activechat. As soon as you add new intents and refresh, the new skill is appearing in your bot and you can use all the blocks in a much nicer interface than Dialogflow. Wit.ai integration (Facebook’s NLP with many more languages) is on the roadmap as well. There’s much to improve in that department. The broadcasting feature is very simple, one can pick a skill to redirect to and the time of the message to be sent out. Being able to send directly to skills is an amazing thing, I just don’t want to set up my targeting there, having no way to confirm at the number of messages to be sent etc. But it can make it easy to reuse content or send silent updates to specific users (for example next live webinar time). There are no subscribable sequences in the meaning other bot builders use it, but it’s not that difficult to create them. The delay block is for this and it’s has another cool feature. You can set it to a certain time. You can build a skill where you deliver a challenge or 3 day video flow only by stacking these wait blocks. The ability to schedule recurring broadcasts is also on my ‘must-haves’ list. Maybe there’s a quick hack to bypass this, with the lack of Broadcasting api I’m not sure about it at this point though. The format of the variables can be a little bit discouraging with no technical background (like me), but once you understand how these work you’ll love the options you get. So basically every variable starts with a $ sign and needs _ for it to work (same for skill names). Having said that, you can do some more advanced things such as using the built in time variables (which day or hour it is currently) or having all the Dialogflow and shop engine variables delivered to you just by a one time api connection (copying the a few characters :)). The ref url can have multiple parameters in it, which is worth a whole new article and pretty much unseen before in bot builders. This helps saving multiple things about a user (for example, product name and category etc.). If you’re new to this, please make sure you read my article on why it could be a good idea to install facebook customer chat plugin on your site. Nothing explains the setup of this tool better than the description provided right in its builder. For ecommerce stores it’s inevitable. Strongly suggested for everyone else. You can choose between regular and discount checkbox, where ActiveChat also helps you with the button creation. I like to go with an own domain address for better brand experience, but the simplicity of this can be really helpful for many, creating an easy hosted optin page for your website.. Creates exactly what the title suggests – a link and a QR code referring to the bot’s page on Messenger. There’s none. ETA February. Until I suggest this tool, which can help you create a campaign for multiple posts at the same time, so you only send private messages only once for the users. No live chat. Coming in March. This is obviously where ActiveChat shines. Having not just one but 2 native shop integrations already is remarkable. I’ve seen some of these in earlier stages and was definitely convinced that this will make WooCommerce and Shopify shop owners (and their bot builders) life way easier. What Andrew showed me was the dynamic cards/galleries function. This is completely automated and does not require any complex programming. You can display product categories, product listings, variations, multiple product images and shopping carts, and customize these galleries with interactive elements (like buttons) easily, right in the Visual Chatbot Builder. There are 2 main areas where e-commerce shops can vastly benefit from adding chatbots. Cart recovery and good NLP (many questions, need to understand some of the contexts). We’ve already talked about the latter one, cart recovery I haven’t got into yet so will not talk about it for now (stay tuned). One of the core issues I faced when I first got into contact with ActiveChat is that many users type things in a different way we’d like to have and chunk up some of their messages. ActiveChat has an amazing and innovative way to bypass this issue. as you can see with ActiveChat you can combine 2 messages into one variable. As you can see it’s not perfect and we have no space once the new message started, but think about other use cases where it can avoid the bot triggering again and again and you rather give a chance for the user to say their intent properly. By the way, the feature to trigger any skill just by the / and the skill name is awesome and helps a lot while testing (and letting others test). When it comes to creating the conversation itself, the user may be again surprised with the amount of options. The automated “typing” tool controlling the natural flow of the conversation or the “polite delay” letting the user type are really to be appreciated. This sentence has exactly 67 characters. To track the time of auto-typing we could use a separate counter. But why not have ActiveChat do it for us? $_seconds will give us the exact current time in seconds. Setting up the appearance of the first $_second and the other one to 0ms, the whole time in between is going to be the auto-typing time. So it takes the bot approximately 3 seconds to autotype. Dividing it by the number of characters we get around 45 milliseconds per character. Having different tested longer texts as well, this was not entirely linear, so I still not entirely sure how this works. Also, in many cases I don’t want to pretend the bot is a human, so not always better to wait more before bigger texts. What I would be really interested is having a typing (waiting) function after the text to be automated. So when you send more texts after each other, you can leave some time for the reader to digest your message. Sometimes it’s hard to find the right amount of time. While testing I’ve found an interesting part when tried to do a redirect (send to other skill). It offered me to send to more than a single user. This is a really fascinating feature. Basically, you can get data back into the bot based on user’s actions on your website. All you have to do is add a little code snippet to your pages. Supplying us (marketers and business owners) with valuable targeting opportunities. It’s actually mind blowing and I’m still wrapping my head around it. This blog is focusing on Facebook Messenger, so just quickly want to mention that there are 2 other platforms currently available (Telegram and SMS) and a few others are coming (voice interfaces). I’m super excited about the latter and hopefully can update a few things as early as in March. Popular among tech savvy, private data sensitive and Russian people. Enables different design options. A true list that you can own. Collecting numbers and sending them out automated messages via Twilio is a really great addition and depending on your market can be a huge plus. You can use webhooks that work well with Integromat or Zapier. It’s possible to use this connection also to develop a connection to your own system, CRM, webinar etc. Broadcast api is still missing, but will be added soon. Will update the article when they are added. Native Google Sheet integration supposed to be added very soon as well, as I know someone is working on it already. No ETA. The reason I say that it’s good for agencies is not just because of the rich NLP integration or the different messaging platforms. ActiveChat supposed to roll out with a white label option very soon, providing you an opportunity to use your own branding in the backend so the client thinks you have all this setup. As far as I understand, you can also negotiate limitless package. Also, you can sign up as an affiliate and earn up to 40% by referring it to your clients. ActiveChat comes with 4 different plans, giving a suitable solution to different needs. The free plan has no branding, limited to 500 users and 1 platform. For many small businesses that could be already a suitable solution. With the Starter more users and broadcasts become available. Architect is where site tracking, ecommerce integrations and multiple platforms come into play. The shop integrations can easily pay for the plan just with a few click. The agency plan seems to be a no brainer if you’re selling chatbots, especially when whitelabel will be added as well (in the roadmap). So far I can say it’s the fastest I’ve experienced in terms of bot builders. They have a chat widget for logged in user’s and it’s easy to open and copy a screenshot if you have a question or issue to solve. I expect them to grow massively in the next few months so we’ll see how are they able to keep up with the increasing number of questions. I’m very positive about the future of the software, I know it had some seeding already so financially in a good place to focus on growing. Being based in Ukraine is definitely helpful to find good and affordable workforce. The team seems to be in integrity and the CEO is doing a great job so far to achieve his goal, to become the best bot builder. His overall knowledge and technical background helps massively to make the software an advance but still easy to use tool. We have a massive list of updates coming in March when the platform will be renewed a bit, if they keep their promises I have no doubts that it can become one of the biggest players in the chabot space. I definitely recommend to check it out, it comes with a 14-day free trial so through up a bot quickly and see how do you like it. Some of the things it lacks as of now can be compensated (for example just use the FB inbox instead of native live chat) or worked around (eg.set a 7-day delay and start again for recurring broadcasts). If you are interested in learning more about Messenger marketing and start selling chatbots, make sure you’re on my early-bird list when Bot Mastery 2.0 launches. A brilliant write up on ActiveChat! Thanks for reviewing us! I would be happy to offer help to your subscribers in getting the most out of our platform. Please expect to have more videos, manuals and webinars soon. Thank you Andrew for being always helpful and offering value. I am an agency getting into bots. I go to know your software through appsumo. Do you have a good person that can help me with getting started. As a coach for marketing questions. I trust my guys to do the technical stuff.